After a weekend of no-fly zones across the UK and thousands of people stranded abroad, there is some light at the end of the tunnel. National Air Traffic Services (NATS) have issued an updated statement saying that Scottish and most of Northern England airspace should be re-opened at 7.00 tomorrow. Services will be able to operate south to a line between Teesside and Blackpool. “Assuming there are no further significant ash emissions we are now looking at a continuously improving situation.” NATS said. 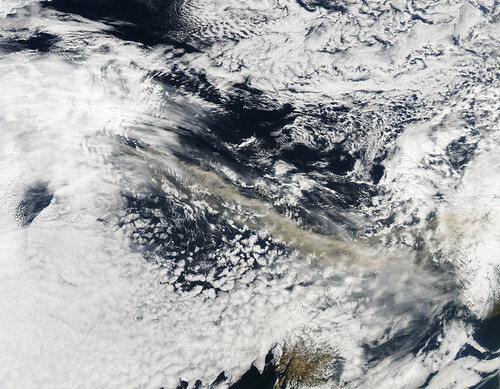 It added that while there was a changing situation, the latest Met Office advice is that the contamination area will continue to move south and that the volcano is currently not erupting to an altitude that will affect the UK airspace. This gives the possibility that airspace restrictions above England and Wales – including the London area – maybe lifted later tomorrow, NATS added. ABTAchief executive Mark Tanzer said: “This is very good news for passengers. It will enable the normalisation of travel arrangements to begin, but this will necessarily be a phased process, due to length and scale of the suspension. “Priority will be to return overseas passengers to the UK as soon as possible. A Manchester Airport spokesperson said: “NATS has confirmed that UK airspace will progressively open tomorrow. “Consequently, Manchester Airport will be open from 09:00 on Tuesday 20 April 2010 unless there is a deterioration in conditions. “It is absolutely essential that people contact their airline before travelling to the airport for any flight because schedules will take some time to return to normal. A further NATS update is due to be given at 21.00 tonight. The update will be found through this link. I like the detailed content that you have. Have you ever considered submitting your blog to ebay ? Keep up the excellent work.